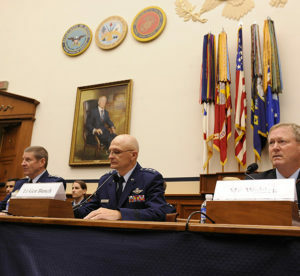 Gen. Robin Rand, the Air Force Global Strike Command commander; Lt. Gen. Arnie Bunch, the military deputy assistant secretary of the Air Force for acquisition; and Randall Walden, the Air Force Rapid Capabilities Office director, testify during a hearing in Washington, D.C., Sept. 29, 2015. They are experts in Air Force long range strike capabilities. 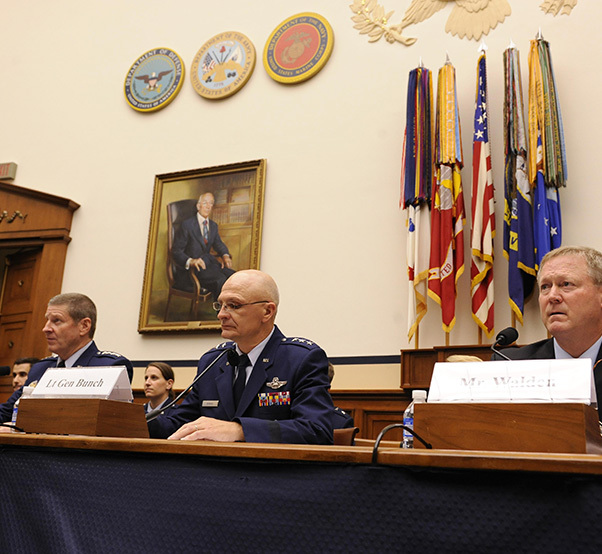 Gen. Robin Rand, the commander of Air Force Global Strike Command; Lt. Gen. Arnie Bunch, the military deputy for the office of the assistant secretary of the Air Force for acquisition; and Randy Walden, the director of the Air Force Rapid Capabilities Office, all responded to questions from the Seapower and Projection Forces subcommittee on the Air Force’s efforts to award a long-range strike bomber. All three leaders agreed combat commanders and the nation need a new long-range strike bomber in the bomber fleet. When it comes to affordability of the new bomber, Bunch said they aren’t just focused on developing and procuring the LRS-B, but they are focused on the entire lifecycle cost of the platform. With less than 160 Air Force bombers, the newest of the three bombers is more than two decades old. 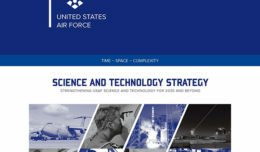 “The Long-Range Strike Bomber program will be built as a capability for today, with an eye on tomorrow, both from a threat and evolving technology perspective,” said Walden, whose office handles LRS-B development, upgrades to Washington D.C.’s Integrated Air Defense System, and experimental operations of the X-37 Orbital Test Vehicle. 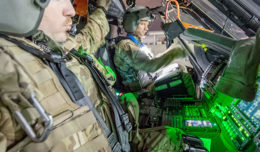 When asked about the impact that would occur if the Air Force wasn’t able to acquire a new bomber, the trio agreed the new LRS-B is crucial to the branch’s ability to execute national military strategy.